So there I was, thinking about how I was going to start this blog post; I'd been meaning to compare investing to Smeed's Law — a behavioral theory that predicts the rate of traffic fatalities — for a while. Determined to come up with something vaguely witty and quasi-relevant to kick off this post, I sat in my car for a moment before going into the 7-Eleven for my morning Double-Gulp when — WHAM! — it hit me! I mean, really, it hit me … some cat driving an Audi A4 ran into me in the parking lot. Seriously, dude?!? Who runs into a parked car?!? Oh well, as Old Man O'Malley used to say through the fog of cigar smoke encircling his head: "some days youse da dog and odders youse da hydrant." Today was shaping up to be a hydrant day, for sure . . .
And that's what makes Smeed an unwitting market philosopher. Markets are all about calibration of risk, and his insight was that as people feel safer, they get more reckless. Comfort breeds complacency. You can fiddle with speed limits, pave roads, install air bags, ticket people for manner of infractions, but folks just end up stretching their envelopes of comfort until they undo the putative progress; they calibrate to the risk. And the same is true for the markets: just think about the banks that kept stretching (in every way) and the hedge funds that kept getting pushed to add risk because their volatility was too low. Maybe now that memories of a crack-up are fresh in people's minds, they'll be a little more cautious, but that caution will be thrown to the wind as soon as we all get comfortable again. Inevitably, we'll have some regulations and rules thrown at the markets. But what real effect will that have? Remember when the "circuit breakers" were established after Black Monday? Traders joked that trading curbs would give people a couple of hours to write out their trade tickets while the markets were "cooling off." But no matter the safeguards we put in place, regardless of who we call systemically important, it's darn-near impossible to save us from our reckless selves. But maybe it's New Hampshire that has it right: it's the only state in the Union that doesn't have a universal seat belt law. 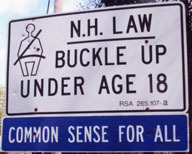 For those of you who've never seen it, New Hampshire's roadside seat belt signs say: "BUCKLE UP UNDER 18 / COMMON SENSE FOR ALL." Does it surprise anyone that the Live Free or Die state is number 49 in the among the 50 states in traffic fatalities? Maybe we all could use a little more common sense and a little less regulation, on the road and in the markets? ← DC-8s and Tigers and GPs! Oh my! There are at least two reasons for regulation – one to try to limit risk; the other to prevent very smart people from profiting by manipulation to the detriment of others. A year and a half into this financially-driven national recession we haven’t done anything meaningful about either. Interesting and humorous post though.